Lettering sample – Transformers Multiverse. It’s a while since I’ve displayed any fresh lettering samples – unfortunately, a lot of what I’m working on, I can’t presently show. So, it’s time to ROLL OUT THE FAN COMICS! 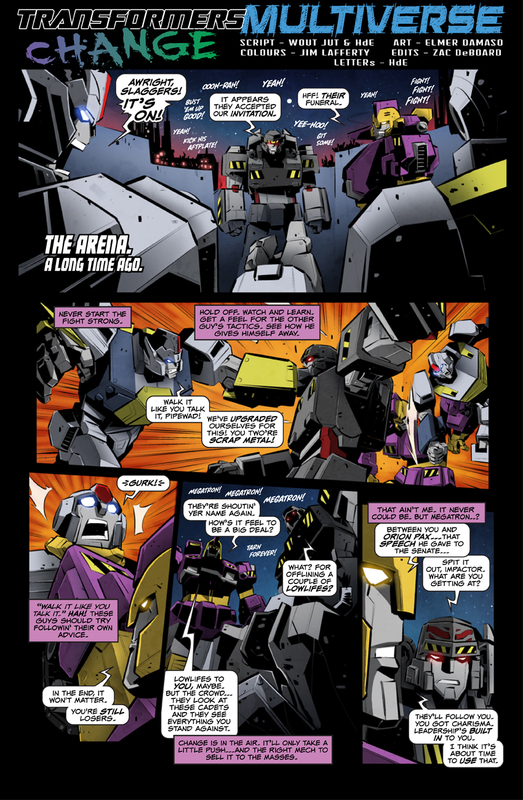 ‘Transformers Multiverse’ is an ongoing fan comics project, much in the vein of the now sadly defunct ‘Transformers Mosaic’. And, wouldn’t you know it, I’m the guy who set it up! It’s open to all, but we do ask that pieces conform to our submission guidelines. This latest piece is penned by Wout Jut, who came up with the basic framework of the story. After receiving the script and art, I smoothed out some of the bumps, did a little on-the-fly editing, and just generally tried to polish it all up a bit. Now, quite honestly, I don’t get a lot of projects where I’m asked (or even allowed) to do this, although other letterers tell me they’ve done things like this in the past. I’m always worried about treading on anybody’s toes by altering the way their dialogue is phrased, or the flow of their narration. It’s really NOT something I do on 99.9 % of the work I receive. But it’s really great to know that you have the principal writer’s blessing in this regard, and to have free reign to add something to a comic like this. This one-page is also notable from a lettering stand point, because it’s another step towards achieving a goal I’ve set myself. I really want to make sure my lettering on this sort of thing feels like it’s apt to the material. Hence, I’m altering the shapes and tail designs of speech balloons, and just trying to add to the ‘feel’ of the pages. I can’t wait to do the next one!